Today I woke up at 6:30AM (oh, is that why I’m so tired?) 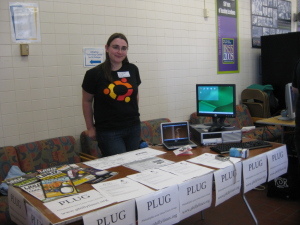 to head out to the Trenton Computer Festival where I was running a table to promote PLUG. I was accompanied by friends Stephen Nichols and Mike Edwards. Upon arrival things were a bit confusing – but within about 20 minutes we’d finally found the appropriate person in charge of the special exhibition tables and were able to get our table set up alongside the table for the New Jersey LoCo Team. 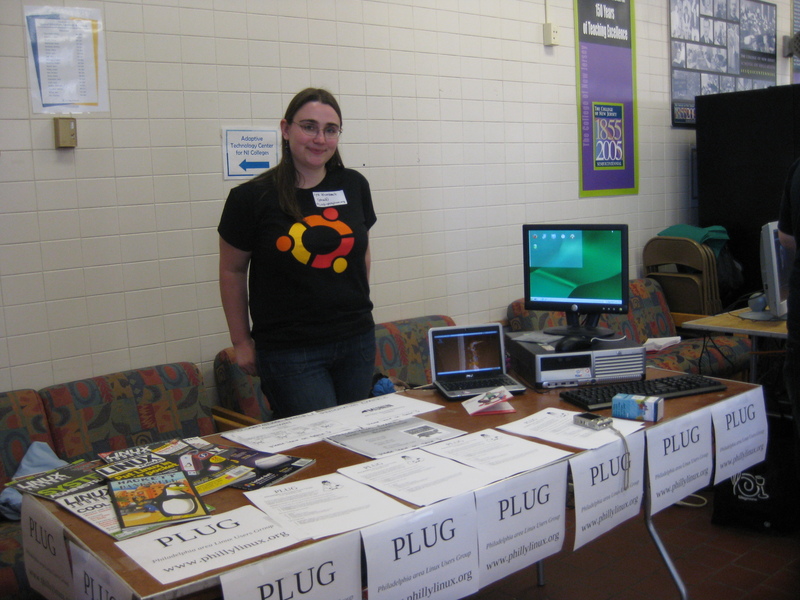 We set up the table, I brought along my test server which I decided to toss the KDE version of OpenSuse 11.1. Why OpenSuse? Because I had the DVD! And I wanted something other than Kubuntu to show off KDE, we’re a LUG after all, don’t want people thinking we cater to just Ubuntu even though that and Debian are my particular choices. We also had some Linux magazines so people could check out some of the cool things being done with Linux, but I might consider stickers with “Demo copy only” on them next time so people don’t try to walk off with them. We also had some printed out slides of past presentations that people could browse through, and handouts detailing the PLUG locations and giving some basic info about the group (I have some thoughts on improving these, but my pile of about 120 was reduced to about a dozen by the end of the day, hurrah!). But the star of the show? My mini9. 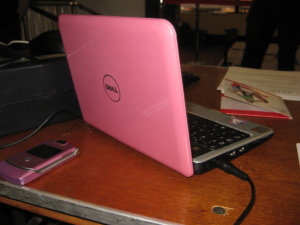 I guess I hadn’t really experienced much of the netbook craze first-hand before, but people really love these things, and communing with other mini9 owners is loads of fun – yes, the mini9 owner who decided to come up and show off his running Windows Vista. 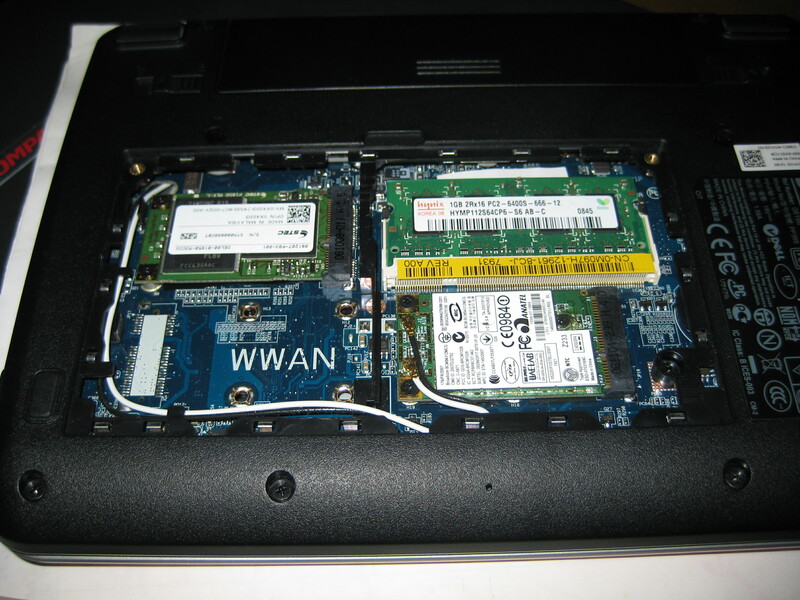 I even found myself taking the bottom panel off a half dozen times to show off the easy access to RAM, SSD harddrive and wifi card. In all, a hopefully very productive day! It would be great to see some new faces show up at PLUG following this. And a huge thanks to the NJ LoCo team for hooking us up with the extra entrance bracelets for our volunteers! I hung my hat up for the table at today’s festival close, but tomorrow Kam will be at the festival doing a talk and manning the table. Oh, and it was also quite hot today, flirting with 90F (32C) at the peak. In April? Really? Ah weather on planet Earth. Indoors we felt none of this until going outside, but moving the computer stuff across campus to the car after the festival was more of a chore than I had planned. Luckily when I got home my 3rd floor apartment didn’t get too terribly hot over the course of the day, here’s hoping the trend continues tomorrow, it’s supposed to be another scorcher. This entry was posted on Saturday, April 25th, 2009 at 9:28 pm and is filed under computers, events, plug, ubuntu planet. You can follow any responses to this entry through the RSS 2.0 feed. Both comments and pings are currently closed.